Have you ever wondered how your body gets rid of the poisonous substances you take in on a daily basis? It is not the supposed blood cleanser advertised to you in the bus or at the motor parks by herbal medicine practitioners. Together with your liver, the kidneys are responsible for cleansing your blood of all harmful substances every day. Every activity in the human body generates waste materials that are released into the blood as the blood leaves tissues and organs back to the heart. Your kidneys function like a very good sieve sifting these waste (toxic) substances from the blood passing through it. The sifted toxic substances are passed into the urine while the cleansed blood is returned to the heart to be pumped round throughout the body. In addition, the kidneys are responsible for removing excess water from your body; they are also involved in maintaining a healthy blood pressure, ensuring the bones are strong, and in the production of red blood cells. One of the early signs of an impending kidney problem manifests in the urine. If you find yourself urinating more often than usual during the day or night it means your kidneys are losing their ability to form urine the proper way. There may also be changes in the urine colour from the normal pale colour to a dark one, presence of blood in the urine, or the urine becoming foamy. Because the kidneys remove excess water from the body, a failing kidney will lead to accumulation of this excess water in the blood which will start leaking out into the tissues with time; also, this excess water may put more workload on the pumping function of the heart leading to heart failure. The overall result is swelling of the legs, ankles, feet and face. If this occurs following changes in urination, it is very likely the kidneys are losing their functions in the affected person. When the kidneys don’t cleanse the blood of waste substances like urea due to its failing function, these substances build up in the blood; the brain sensing them triggers vomiting. In addition, the build up of these toxic substances may lead to bad breath, food having an unpleasant taste and loss of appetite in some people. Because the kidneys are involved in the process of red blood cell production which carries oxygen and nutrients to every part of the body, a damaged kidney, over months, will fall short of this function. This means reduced production of red blood cells and subsequently inadequate oxygen transport to the body cells, and this manifests as general body tiredness due to inadequate oxygen and nutrients supply for energy production. The excess water accumulated in the blood due to a failing kidney may leak out into the tissues of the lungs. Together with reduced red blood cell production, this leads to shortness of breath and cough. If you have noticed any three of the above signs consistently for some weeks now, especially the first three, do not waste any more time in consulting a doctor called a nephrologist who specialises in treating diseases of the kidney. Any federal medical centre, teaching hospital, good general hospital or private specialist hospital will have a nephrologist or refer you to one. The nephrologist will take a very detailed medical history from you, perform a thorough physical examination on you and recommend you do some medical tests and investigations specific to the kidneys after which he will discuss the treatment of the specific kidney problem with you. 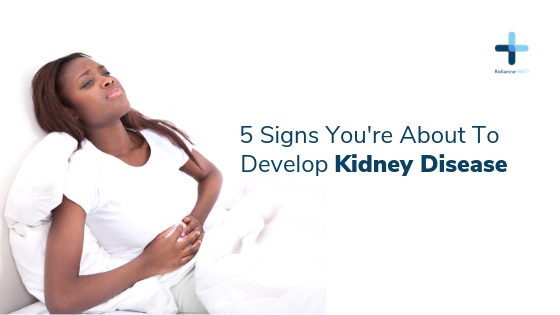 Doing this at this stage of noticing the early signs will help arrest the particular problem causing the kidney damage and possibly prevent the condition worsening to a state of needing dialysis 3 times a week or a kidney transplant for survival. It is also important to note that poorly controlled diabetes and hypertension are the leading causes of chronic kidney disease in adults all over the world. Other risk factors include smoking, obesity, heart disease, abusing drugs like aspirin and antibiotics, taking herbal concoctions, presence of kidney stones, untreated prostate gland enlargement and a family history of chronic kidney disease.